We're making huge progress on our dining room, especially in our plaster restoration efforts! A little while ago we gave you all an update on the plaster restoration progress on our Foursquare's dining room walls. 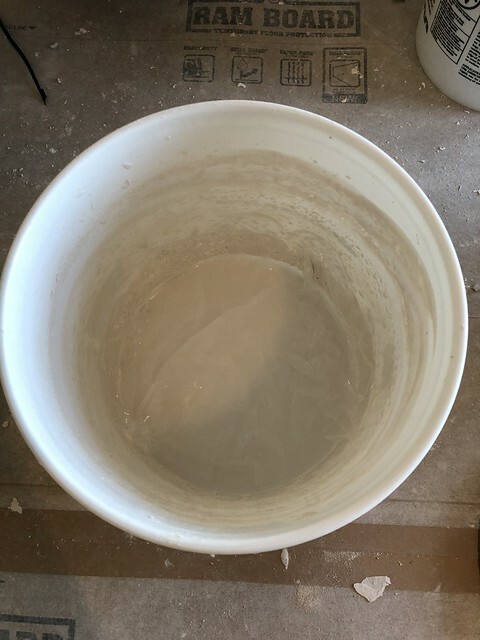 We'd successfully patched missing sections, rolled on the Plaster Weld bonding agent, and applied the base coat of Structo-Lite plaster with embedded fiberglass screen. In short, we had a solid foundation on which to launch our Master of Plaster restoration process. We last used Master of Plaster's restoration plaster in our living room renovation project a few years ago, and we loved it back then. Now, a few years later, we are giving it a go again to see if we still feel the same. 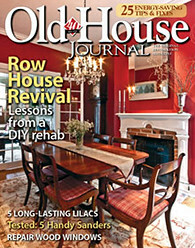 We ordered and had all of the product delivered to our local Old Town Alexandria Ace Hardware. 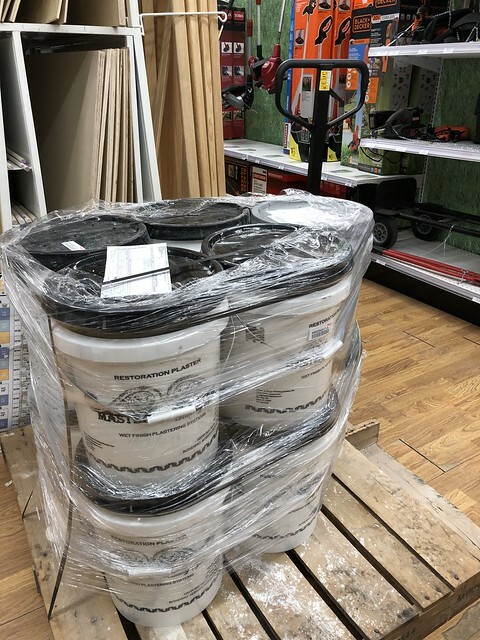 Since they are a commercial location that regularly receives large shipments, this saved us a good amount of money on shipping. The whole pallet came in at about 600 pounds, so we drove down and loaded everything up in the back of our car to get it to our project. The order was for more product than we'd need for the dining room, as we also plan to use it on the hallway walls later this year. 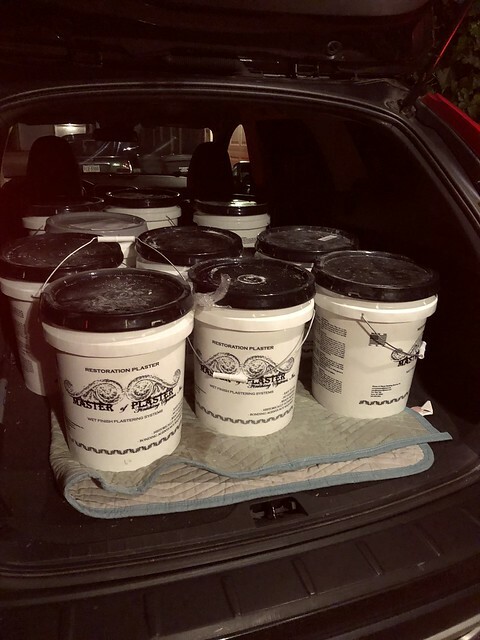 For our dining room space we'd really only need about four buckets of the base coat and less then half of the finish coat. When we were ready to go we actually started with a leftover partial bucket from our last project. That's one of the really nice things about the MoP product, as long as you put a little water on the top of the material, it can sit for a very long time without drying out. When it comes time to finally use it, you just need to give it a quick mix and it's good to go, even if you are picking up a partial bucket you last used long ago. The really interesting thing about using Master of Plaster this time around is that I started by applying the old partial bucket of base plaster first. It felt familiar, the same as it had previously. No problems with it sitting for more than a year, it mixed right up and was going on just as it had in the prior room. I quickly ran out of the old partial bucket of plaster and moved onto using the new buckets. As soon as I started to apply the new plaster to the wall I noticed a crazy thing. The old plaster felt like it had larger pieces of aggregate mixed in. I could feel it when the trowel skimmed across the old plaster with a bit of a coarse crunch. But when I was using the new plaster it all felt so perfectly smooth. After I started with the new bucket I wrote the unbelievably knowledgeable Lauren at Master of Plaster to let her know everything was going well (they have excellent customer support and advice), and asked if the recipe had changed from the first time I'd used the product. She told me that the recipe hadn't changed, but the manufacturing process had a little change. Master of Plaster has started screening the limestone to eliminate the larger pieces from the mix. Applying the new plaster is even more straight forward than it was a few years ago. The finer limestone makes it far easier to apply the base coat plaster in a smooth and even manner. There's no longer a concern that some of the aggregate could catch on the trowel and drag through the coat of plaster. I worked my way around the room with the base coat, trying to lay the first coat in as smooth of a manner as I could, but not worrying too much. One of my favorite parts of the working with this material is the ability to smooth imperfections once it's begun to set. All you need to do is spray the slightly setup material with water and smooth with the trowel. This will allow you to force any imperfections out of the surface, leaving a nice and smooth polished based coat, ready for the finish coat. Here's a little video that describes the whole process. 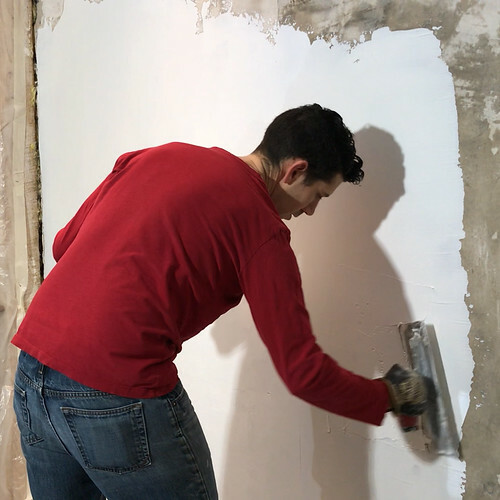 Let me tell you, there's really not much better of a feeling when working on plaster than to see a wonderfully smooth and crisp wall taking shape. To be totally honest, the base coat is nearly good enough for paint, and would probably look perfect if you were going for a slightly more rustic or raw plaster look. We will still apply the finish coat to make the walls absolutely smooth, but this step alone left the walls looking pretty damn great compared to where we were just a few weeks before. We did have a strange issue in one small section of our wall where air bubbles formed beneath the plaster. This was easily resolved by going over the portion of the wall with the trowel to force the air out, but it was important to take care of it before it totally set up. We've been working on a ton of projects over the last little while, but wanted to give you all an update on our progress, as things have been a little quiet on the blog of late. We're really moving along on the dining room project and can't wait for it to be done! So much good info, and interesting too, even though I'm unlikely to ever do plastering. Those walls look really smooth already, at least in photos. Nice work. What else is happening in the DR? Any purchases/DIY things? I’m curious anout the way yoi handled your plastering because I think I have the same circumstance amd meed a little guidance. I live in a 1890 Victtorian that I am renovating and would like to retirn the walls to the original plaster finish. Like your home, the previous owner applied 3/8” drywall over most of the exising plaster walles amd I want to remove it and apply new plaster. Since I had to raise part of the home a couple of inches I have cracked much ofvthe drywall and ecpect that much of the existing plaster underneath will need to be removed down to the wood lathes. Did you apply metal lathe over your wood lathe and apply Structo-lite as a base coat and then apply lime plaster to finish? That what I thought I understood from your presentation. Correct me if you please. Best wishes. Hi Lee. 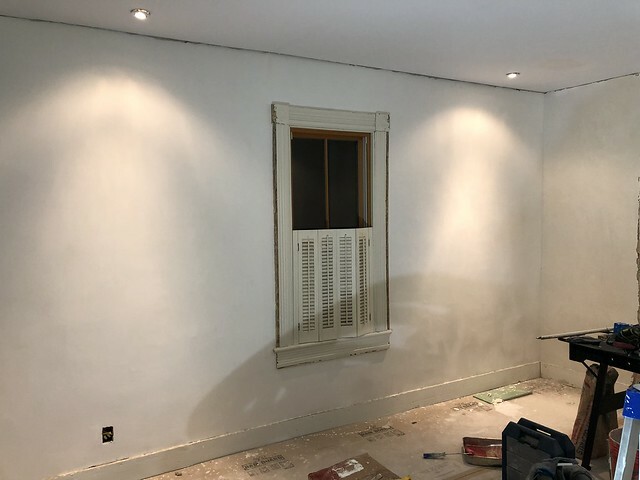 We didn’t remove our original plaster, but rather applied the Structolite over the original plaster after securing it with plaster buttons to stabilize any loose sections, and patching large missing sections with drywall. 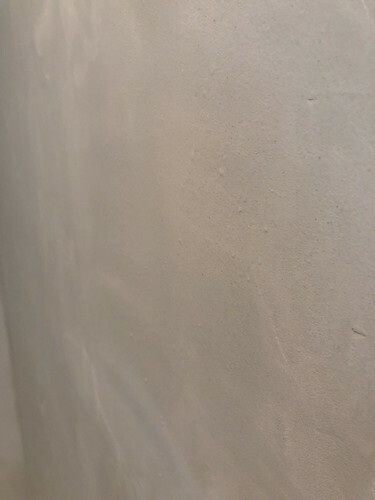 If you have your original plaster and the keys seem intact, even if you have some cracking, you should be able to follow our approach of skimming plaster over existing plaster. If your keys aren’t intact you still may not need to remove it if you use a plaster securing product, like Big Wally’s Plaster Magic, to adhere your plaster back to the wood lath. What did you use to keep the plaster off of the trim work?